I just wanna know if what happened to the upcoming talkshow off Mr. Martin Nieverra? I think nakasaad dun ang isa niyang talkshow right? Hopefully, matuloy to and itapat sa Walang Tulugan. No news on that one... I think its still part of his contract but right now, its not on their radar. Oh but hopefully every Saturday ito maybe Bamboo, Sessionistas, True Colors from Showtime, El Gamma Penumbra, Regine Tolentino, Sexbomb Dancers and Comedian from Banana Split "Laffline, Metrobar" as the regular performers and casts. sana talaga ipantapat ito sa Walang Tulugan back to back with Banana Split. your late night will never be the same. U asked for it U got it! “martin [email protected]”- FRIDAY MARCH 1st. where else,but on ABS-CBN CH.2!!! That's great news! But weird that he just started to announce it, they need to start advertising and hype this up like Banana Nite. we have Banana Nite that will air every Monday - Friday starting on February 25, 2013 plus now we have Martin Late @ Night and there is also a rumor to have a new Comedy Show entitled "Big Mouth" that will airs every Friday Night. well I must suggest Martin Late @ Night will move on weekends? maybe after Banana Split Extra Scoop? so we can have a show that will compete to Walang Tulugan? Clarification time... BIG MOUTH is Martin Nievera, there isn't another program with PGT's Big Mouth. It's Martin, lol. What show will go head to head with Martin's program? Isn't Bubble Gang already over before this airs? 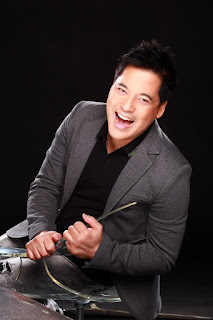 ABSCBN Muling Bubuhayin Ang "MARTIN [email protected]"
Singer Martin Nievera is returning to the late-night time slot as he resumes his stint as a talk-show host. In his official Twitter account, Nievera confirmed the return of his late-night talk show "Martin [email protected]," which is set to air on March 1.
same. You asked for it you got it! There it goes. Martin [email protected] is back! MANILA, Philippines -- Singer Martin Nievera is returning to the late-night time slot as he resumes his stint as a talk-show host. In his official Twitter account, Nievera confirmed the return of his late-night talk show "Martin [email protected]," which is set to air on March 1. "Your late night will never be the same. You asked for it you got it! “Martin [email protected]”- FRIDAY MARCH 1st. Where else, but on ABS-CBN CH.2," Nievera tweeted. Apart from singing and doing concerts, Nievera also carved a reputation as a loquacious late-night host with "Martin After Dark," which ran from 1988 to 1997. This was followed by "Martin [email protected]," which aired on ABS-CBN in 1998 and ran until 2002. The announcement of Nievera's new show comes on the heels of the launch of the Kapamilya network's new late night gag show. On Tuesday, ABS-CBN held a press conference for "Banana Nite” which airs after “Bandila” beginning February 25. Dubbed as the "daily serving" of weekly gag show “Banana Split”, the new show will feature spoofs and gags , just like in the original “Banana Split” which will still air every Saturday. “Banana Nite” will premiere on February 25 and includes Panganiban, John Prats, Zanjoe Marudo, Jason Gainza, Pooh, Melai Cantiveros, Ryan Bang, and others. I doubt it cuz I heard Martin will start 'taping' soon. I would love it to be live and make it interactive like the previous late night programs ABS have had.